Move on to 1964 or back to 1962. BJF, 1963, Can you cope with the Weather? South Wales Echo, 3 January. BJF, 1963, Fluoride: Poison or Medicament? Western Mail [leader page], 1 February. BJF, 1963, A Point of View on Fluoride, Penarth Times, 1 February. BJF, 1963, There is Life in the old Moon Yet, South Wales Echo, 1 February. BJF, 1963, This Bird is No Raven, South Wales Echo, 8 February. Austin, Tony, 1963, Chilling Reminder of a Killer Epidemic, Western Mail [leader page], 12 February. Leader, 1963, Fluoride Fears, South Wales Echo, 13 February. Report, 1963, Vote Urged on Fluoride, Western Mail, 14 February. BJF, 1963, Nuclear Blasting, Correspondence Column, Western Mail, 15 February. BJF, 1963, Your Teeth and You, Correspondence Column, Penarth Times, 15 February. Reader, 1963, Fluoride, Penarth Times, 15 February. BJF, 1963, Fluoride, a reply, Correspondence Column, Penarth Times, 15 February. Reader, 1963, Dental Association, Correspondence Column, Penarth Times, 15 February. Announcement, 1963, BJF lecture to Astronomical Society, South Wales Echo, 16 February. Programme, 1963, BJF lecture: Recently Evolved Methods of Astronomical Observation, with Comments on the Origins of Life, Cardiff Astronomical Society, 17 February. Anon, 1963, The Beauty in a Snowflake [picture feature with micrograph by BJF], Western Mail, 18 February. Reader, 1963, Go-slow Urged on Fluoride [letter], Western Mail, 20 February. BJF, 1963, Must we Abandon our Countryside? Western Mail [leader page], 21 February. BJF, 1963, [Illustrated Lecture], Recently Evolved Methods of Astronomical Observation, with Comments on the Origins of life, Cardiff Astronomical Society, 22 February. BJF, 1963, Bang go the Windows, South Wales Echo, 22 February. BJF, 1963, Give me Centigrade Any Time, South Wales Echo, 23 February. BJF, 1963, Derby Neck, Western Mail, 26 February. Reader, 1963, It's Safe, Correspondence Column, South Wales Echo, 26 February. BJF, 1963, Be Cautious, Correspondence Column, Western Mail, 27 February. Report, 1963, Darwin Stamp from Czechoslovakia, Western Mail, 27 February. Reader, 1963, Tweedy Cranks who Do Matter, Correspondence, Western Mail, 1 March. BJF, 1963, Don't Blame the Weather Man, South Wales Echo, 1 March. BJF, 1963, Tweedy Cranks (reply), Correspondence Column, Western Mail, 2 March. Reader, 1963, Fluoride Letter, Correspondence Column, Western Mail, 13 March. Report, 1963, Typhoid - People Under Observation, South Wales Echo: 1, 18 March. Anon, 1963, [examples of cuttings] Cardiff Jazz Club, 20 March. Reader, 1963, Typhoid, Correspondence Column, South Wales Echo, 21 March. BJF, 1963, Typhoid (reply), Correspondence Column, South Wales Echo, 21 March. BJF, 1963, Restoration of Microscope Slide Collection, Cardiff: Report to National Museum of Wales, March. BJF, 1963, Abolish These Insecticides, South Wales Echo, 28 March. BJF, 1963, Our Gloomy World [food shortage], South Wales Echo, 30 March. BJF, 1963, Saving Rare Species, Western Mail, 2 April. BJF, 1963, Let's have more Off-the-peg Houses, South Wales Echo, 5 April. BJF, 1963, You Were Lucky [home-made beer], South Wales Echo, 17 April. BJF, 1963, I Must Confess - I'm Baffled, [hairy soap], South Wales Echo, 19 April. BJF, 1963, Pipelines for the Future, South Wales Echo, 26 April. BJF, 1963, Working Sound, South Wales Echo, 3 May. BJF, 1963, The Killer on Our Beaches, South Wales Echo, 14 May. Reader, 1963, Beaches, Correspondence Column, South Wales Echo, 15 May. BJF, 1963, Preserving Nature, Western Mail, 22 May. BJF, 1963, Don't Forget Your Polio Beater, South Wales Echo, 5 June. BJF, 1963, Lightning Strikes House [news report], Western Mail, 10 June. BJF, 1963, Our Future? We May ask the Sun, South Wales Echo, 14 June. BJF, 1963, Simple Science: Fight Fire with Guided Missiles, South Wales Echo, 18 June. Report, 1963, Lady of the Manor in Fluoride Battle, South Wales Echo, 3 July. BJF, 1963, Sea Water Fresh, Western Mail [leader page], 11 July. BJF, 1963, The Mysteries of Lightning, South Wales Echo, 18 July. Report, 1963, Odd Fish, South Wales Echo, 18 July. BJF, 1963, Kiss of Life [features], South Wales Echo, 19 July. Gay, 1963, Kiss of Life [cartoon], South Wales Echo, 19 July. Billing, 1963, Beach pollution Standards, Radio Times, 29 July. BJF, 1963, Animal Experiments, Western Mail, 16 August. Report, 1963, The Other Note, Wales and the World, Western Mail, 19 August. Reader, 1963, Vivisection, Correspondence Column, Western Mail, 25 August. BJF, 1963, A Fossil Tree that Survived, South Wales Echo, 13 September. 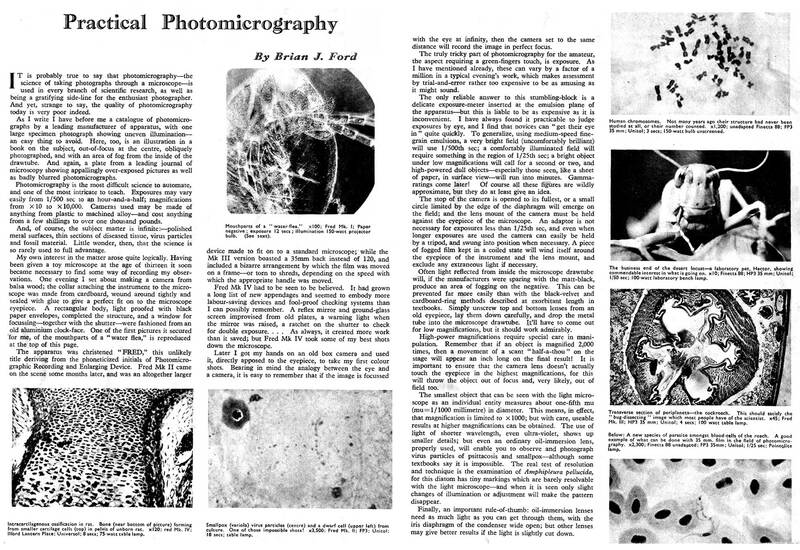 BJF, 1963, Practical Photomicrography, Amateur Photographer, 126 (3893): 456-457, 18 September. BJF, 1963, Politicians Gambling with the Future of Mankind, South Wales Echo, 19 September. BJF, 1963, Instant Colour in your Camera, South Wales Echo, 26 September. BJF, 1963, The Truth about the Simple Toadstool, South Wales Echo, 27 September. Announcement, 1963, The Thaw Estuary, Report by BJF [in] New Books, Cardiff Reference Library, Autumn. BJF, 1963, Don't Poison the Family, South Wales Echo, 2 October. Reader, 1963, Meat Danger, Correspondence Column, South Wales Echo, 5 October. BJF, 1963, Meat Reply, Correspondence Column, South Wales Echo, 5 October. BJF, 1963, Science: The things you Women put on your Faces! South Wales Echo, 18 Oct.
BJF, 1963, Don't Blow Yourself Up Tonight, South Wales Echo, 5 November. BJF, 1963, Science: Anti-Heart Serum, South Wales Echo, 7 November. BJF, 1963, Danger, Poison for Sale, South Wales Echo, 21 November. BJF, 1963, Dicing with the Basis of Life, Western Mail, Leader Page, 26 November. BJF, 1963, Their 'Failure' Brings Hope, South Wales Echo, 29 November. BJF, 1963, Here's my Answer to Pollution, South Wales Echo, 6 December. Report, 1963, BJF's Christmas Card, Western Mail, 24 December.